What position should one take with regard to the Crimea? 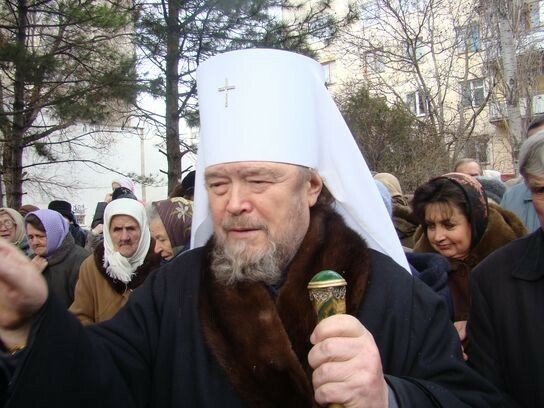 Epistle of His Eminence, Metropolitan Lazar of Simferopol and the Crimea, to the flock, monastics, and all faithful children of the Diocese of Simferopol and the Crimea of the Ukrainian Orthodox Church, in connection with recent developments in the Autonomous Republic of Crimea. Dear brothers and sisters! Respected Crimeans! In these days, difficult for us all, of political differences and divisions, many questions have been addressed by the flock to the Ruling Hierarch and clergy of the Diocese of Simferopol and the Crimea: how to behave in the current situation and what position should be taken with regard to the state composition of Crimean Autonomy. The Holy Orthodox Church has for many centuries interacted, and continues to interact, with the state in matters that benefit the Church itself, man, and society, including in questions of the state dispensation of our society. The Church does not impede the Orthodox citizen from expressing his will on any question involving civil law. But today, in the face of various political commotions and open challenges to civil society, I would like to call upon you all, regardless of your different social preferences, to exclude from your public activities any violence, hatred, and discrimination based on national or religious grounds. I would especially like to appeal to the clergy of the Diocese of Simferopol and the Crimea. Recall that, regardless of your earthly differences, the main mission of the Church is the Divine commandment to accomplish the work of people’s salvation in any situation and under any circumstances: My Kingdom is not of this world (John 18:36). We should not forget that the Church is the body of Christ (1 Corinthians 12:27) and the pillar and ground of the truth (1 Timothy 3:15). Christ is all, and in all (Colossians 3:11); and clergy, in the words of the Apostle Paul, should be all things to all men, that I might by all means save some (1 Corinthians 9:22). Beloved brothers and sisters in the Lord! We should all likewise remember that a Christian politician or public man must recognize that, in the conditions of historical reality and especially in our divided society, that majority decisions and actions that bring benefit to one part of society might also simultaneously limit or infringe upon the interests and desires of others. Therefore, particular spiritual and moral sensitivity is required of all of us to recognize that a Christian needs earthly rights above all in order that, possessing them, he might better realize his high calling to the likeness of God and fulfill his duty before God and the Church.